The Authors Show affords authors a platform to tell the STORY BEHIND THE STORY. It gives readers the ability to find new authors, follow favorite authors, and get the general gist of what writing is all about, and how authors weave those tales. Characters you will love. Intriguing settings, and plots that keep the pages turning. 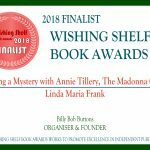 Find all of Linda Maria Frank’s Authors Show interviews about The Madonna Ghost, Girl with Pencil, Drawing, Secrets in the Fairy Chimneys, and The Mystery of the Lost Avenger at the following links.